Musicals come and go on the London stage, but “Man of La Mancha” promises to be something different and special. 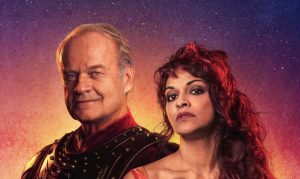 The first West End production of this much-loved show in more than 50 years stars Kelsey Grammer and Danielle de Niese, along with Nicholas Lyndhurst, Cassidy Janson and Peter Polycarpou. The multi-Tony award winning Broadway musical is coming to the London Coliseum. It is produced by Michael Linnit and Michael Grade, the producers who brought “Chess,” “Carousel,” “Sunset Boulevard” and “Sweeney Todd” to the same English National Opera venue. The show’s highlight is the song, “The Impossible Dream (The Quest)” and the story is inspired by the classic novel “Don Quixote” by Miguel de Cervantes. The hero chases his impossible dream, to pursue the beautiful princess Dulcinea – and a few windmills. Don Quixote is determined to uphold all that is good and right at a time when the odds are stacked against him and we are all compelled to follow his unreachable star. Danielle de Niese recently spoke in an interview about her next step into musical theater and West End debut, after shows around the world, at the Royal Albert Hall and more. Mark Beech: How did you get to be involved? Then we met after the show and basically, at that point, Lonny had decided that I have to do this role. It was quick. Sometimes you know artistically, you have these meetings where you can just get somebody’s energy straight away and I think that was one of those meetings. I was also totally blown away by Lonny’s “Sweeney Todd” at the Avery Fisher Hall, electrified by the show. It’s just the rehearsal process, meeting Lonny in the room and devouring this piece and asking questions. Even though it is a well-trodden show, it is the first in London in 50 years. If this show never comes round again, it will be the only time in many people’s lives that they can see “Man of La Mancha.” It’s like making a new production, like having a new musical. Even though it isn’t a new musical. Did you know it for “Impossible Dream” from when you were a kid? Yes, my mum sang it all the time. It was one of her favorite, favorite favorite songs. Exactly. It’s such an uplifting song. And we need that right now. You bet. Then Lonny followed up his introduction with “and then there’s this wonderful actor. Do you know Kelsey Grammer?” I joked “No, I have no idea!” You’d need to be dead to not know him. So it is incredible, and a change to flex different muscles and a return to my roots for me, even though people in the classical world would only know me classically. If you read back throughout my career, you probably see that there’s been lots of quite amazing musical theater things that I’ve done, like “The Sound of Music” at the Last Night of the Proms, but this is the culmination of that. You’ve got a voice that can fill many arenas and, while the Coliseum is big, presumably you’re going to need less amplification than some of the other actors. I think they have to unanimously mike so they will they will balance it. When I sing, I don’t really think about where my voice is reaching to, but it will be more adjusting. What about the other people that are involved? Cassidy Janson is going to be doing performances when you’re not available. Yeah, I’m overlapping with the early production period with “Cendrillon” at Glyndebourne, which, you know, could not be more different, though it is still the impossible dream, the story of Cinderella. I’m really, really grateful to Michael Linnit [the producer with Michael Grade] and Lonny that that they felt so committed to having me in the show that we found a way to make that work. And there are a few other cool songs as well…. Yes, powerful songs, beautiful and yet fragile not similar in musical structure, but similar in the kind of memorable melody of a female character in the way of “Don’t Cry For Me, Argentina” or “I Don’t Know How to Love Him” from “Jesus Christ Superstar.” Something quite vulnerable for the character who is actually quite tough. “Man of La Mancha” opens at the London Coliseum on April 26 and runs through June 8.